Lately, my skin has been drier than the dessert in Sahara. I was looking for an oil that was deeply moisturizing oil but not too heavy. I stumbled up upon Watermelon Seed oil during my research on African Oils. Wow, can I tell you I have found my favorite new oil and I would love to share its interesting history and benefits? Watermelon seeds come from the watermelon plant, which grows on the vine and bears the scientific name Citrullus lanatus. It is particularly common in West Africa, where it is also called kalahari oil. 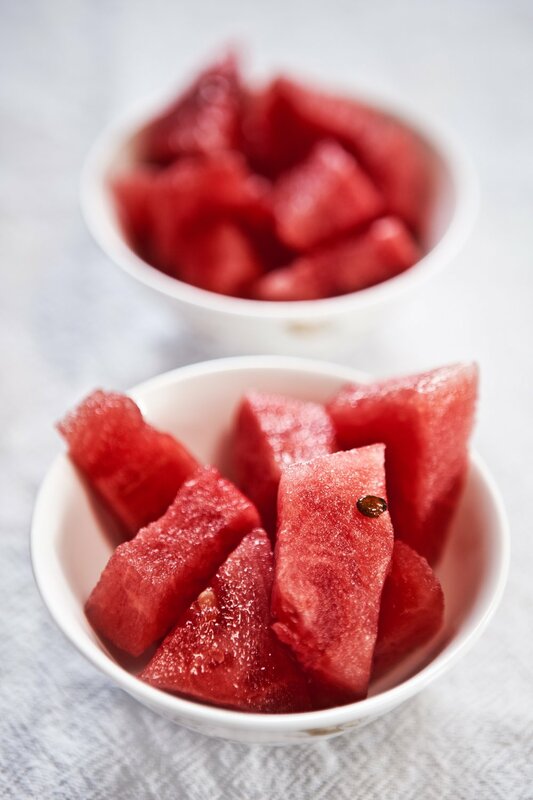 Watermelons originated almost 5,000 years ago in the Kalahari Desert of Africa In Africa, watermelon seeds have been prized for the highly nutritive oil that they contain. Traditionally, the seeds are removed from the flesh and then are dried outside in the sun. Once dried, the seeds are then pressed to extract the beneficial oil. The seeds of the watermelon come in two main colors, white and black, which are the immature and fully developed seeds respectively. The black seeds are the ones you should choose when choosing a seed to snack on and there can be hundreds in a single watermelon. These seeds are rich in certain nutrients and antioxidants and can be prepared in a number of ways to enjoy along with the juicy, pink fruit. Watermelon seed oil has a pale yellow color, it has a slight aroma which is nutty. The oil is high in unsaturated fatty acids, linoleic (63%) and oleic (15%) acids. It is extremely rich in omega 6 and omega 9 essential fatty acids, making it a very nutritive oil. Watermelon seed oil also has high antioxidant activity, with 5% higher levels of tocopherols (vitamin E) than most seed oils. The composition of fatty acids contained in watermelon seed oil helps to soothe and maintain healthy, nourished skin. Watermelon seed oil is also high in magnesium. Magnesium deficiency is one of the leading cause of most skin issues. Light and easily absorbed it helps to balance oil production while restoring elasticity to the skin. It does not clog pores and it allows the skin to breathe which also aids the skin’s natural detoxification process. Watermelon seed oil is one of the most skin nourishing and active botanical oil and it has been used for centuries. It’s a great choice for dry congested skin but can benefit all skin types, including oily, acne-prone or maturing skin because watermelon seed oil is an excellent carrier oil. It is able to deliver other active ingredients and nutrients to the deeper layers of the skin. For the hair and scalp, it encourages healthy hair growth, and when rubbed into the ends of the hair, it helps to repair split ends. Because of its amazing moisturizing capabilities our No. 19 Botanical Body and Facial Oil has 25% watermelon seed oil.